Bergen is located on the south-western coast of Norway, in the county of Hordaland, in between a group of mountains known as De syv fjell ("the Seven Mountains"). It is recognized as the unofficial capital of the region known as West Norway, and also recognized and marketed as the gateway city to the world famous fjords of Norway. The oldest part of the city is on the north side of the bay of Vågen. Here you find Bryggen, a number of old, wooden houses dating from the early 18th century. A popular tourist attraction is the open air fishmarket on the harbour. Further down you find the main shopping area, rebuilt after a fire in 1916 in art nouveau and functionalism, around the main square Torgalmenningen. Several old quarters of white, wooden houses surround the centre, notably Nordnes, Marken and Sandviken. Visitors should not miss the ride with the funicular up to Mount Fløyen, where one is rewarded with a splendid view over the city and the fabled seven mountains. Port Location – Bergen as "The Fjord Capital" and "The Gateway to the Fjords of Norway" is a well-established cruise port located at the center of Bergen. Transport Links - Bergen has an international airport, Bergen Airport, Flesland, with direct flights to many European cities. The Bergensbanen railway line runs east to Voss, Geilo, Hønefoss and Oslo. Public transportation is provided by Gaia Trafikk and Hardanger Sunnhordlandske Dampskipsselskap (HSD). Local train transport to Arna is provided by Norges Statsbaner. There is also a funicular (Fløibanen) and an aerial tramway (Ulriksbanen). Among the fleet of about 450 buses, are 8 trolleybuses (two of them are dual-mode buses), making Bergen the only city in north-west Europe to have them. Eastbound, highway E16 runs to Voss, Valdres and Oslo. Along the coast, highway E39 runs south to Haugesund, Stavanger and Kristiansand, and north to Førde, Ålesund, Molde and Trondheim. Express buses ply both highways, as well as serving numerous other destinations. The Norwegian coastal steamer service Hurtigruten originates in Bergen, running north to Trondheim, Bodø, Tromsø and Kirkenes. Passenger catamarans run from Bergen south to Haugesund and Stavanger, and north to Sognefjorden and Nordfjord. Car ferries connect to Hanstholm and Hirtshals in Denmark, Newcastle in the United Kingdom, Tórshavn on the Faroe Islands, and Seyðisfjörður on Iceland. 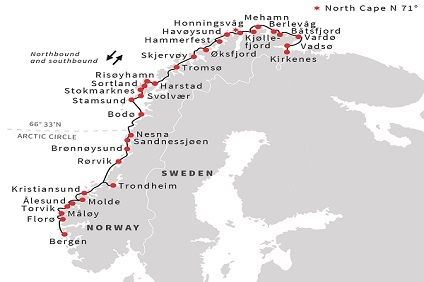 6 Night Cruise sailing from Bergen to Kirkenes onboard Spitsbergen. 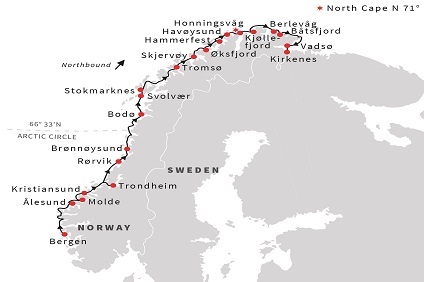 11 Night Cruise sailing from Bergen roundtrip onboard Spitsbergen.